Time to build a second stage and grab new prizes as the second act of the game has just started. Join us right after the jump for its walkthrough! Lisa: Wow, our Rock Festival stage has really brought in the fans. Now it’s time to hit them with our Jazz Festival, right? Homer: Lisa, Rome wasn’t built in a day. Bart: Also, the Romans fed jazz musicians to the lions. Homer: First, we have to expand our audience beyond stoned elderly hippies, to include ignorant narcissistic teens. Lisa: You mean… a pop stage! O.M.G. Homer: Yeah, I think that’s one of the bands. 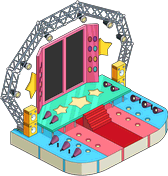 Homer: Our ridiculously glitzy Pop Stage is built. Now, we just need some pop stars. Lisa: If that’s what it takes to get my Jazz festival, I do know one ex-pop star: Ralph Wiggum. Lisa: Although yesterday he was crying because he lost a booger. Ralph: The Party Posse is back! And scary. Milhouse: The beat is droppin’! Nelson: Our look is heart-stoppin’! Bart: And the champagne is… do I really have to do this? L.T. Smash: Your dad signed you all to a 99-year contract. Homer: Fought him down from 100. 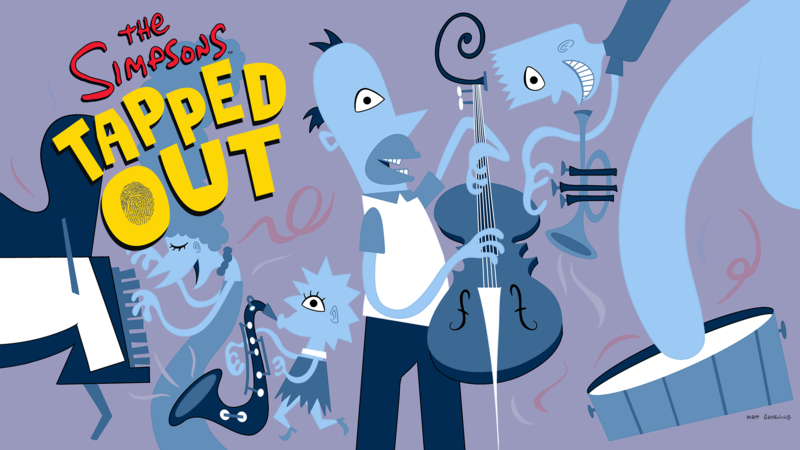 Milhouse: This song’s going out to a very special girl: Lisa Simpson! Lisa: You know, maybe I should switch to playing blues. ‘Cause I am really paying my dues here. Lisa: You were right, Dad, expanding to pop music is bringing in the kids. Although they’re looking kind of tuckered out from all the fun. Homer: Some Buzz Cola will be just the thing to over-stimulate them! Quimby: Plus, it will launch one of our main revenue streams. Lisa: The sales tax on sodas? Quimby: The twenty-five cent fee to use the port-a-potties! Lisa: We’re at a music festival. 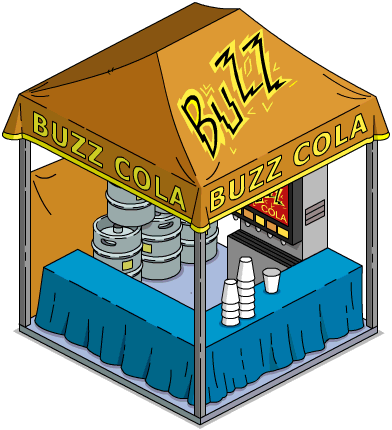 Why is the Buzz Cola tent blasting out its own, different music? Homer: Otherwise you wouldn’t know it was cool. Lisa: Ugh, this pop festival is nothing but overpaid, undertalented local performers. Lisa: We need an overpaid, undertalented international star. Wiggum: Then we’re going to need a pointlessly glitzy, fundamentally unpleasant place for her to hang out with other celebrities. 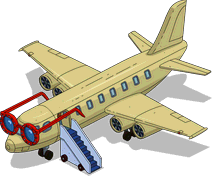 Lisa: Whoever made this plane is definitely guilty of a crime… against good taste. Quimby: If I catch him, he’ll fry. That’s legal, right? Lisa: Well, the plane is glitzy and pointless all right. But will it really attract celebrities? Paris Texan: O.M.G., people! There’s a ladies room in the back of this plane with no line! Homer: The secret to stardom: knowing where the empty bathrooms are. Lisa: Pop sensation Alaska Nebraska just told fans online about Springfield! She must be interested! Bart: Just don’t tell her Moe is running the limo service from the airport. Moe: We guarantee to paw through your luggage while you’re not looking. System Message: You have completed the Act 2 story! Keep expanding your Festival and tapping Fans, Act 3 starts soon! System Message: Happy anniversary Tappers! It’s been 5 years and a day since Homer destroyed Springfield and you destroyed your lives helping him rebuild it. Keep at it!